Steel reinforcing bars, known as rebar, are most commonly used to provide structure and tension support in concrete structures. Rebar generally is priced per foot with slight price variations for thinner or thicker sticks. The surface of the bar is "deformed" or patterned to provide a good contact area for concrete adherence. Early concrete structures did not use reinforcement bars, but rather broken pottery shards as reinforcement materials. 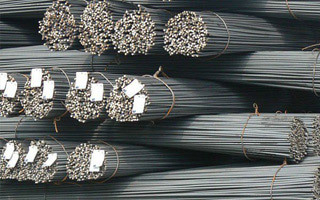 Steel reinforcement is generally divided into two types. Primary reinforcement is designed to support the overall load that construction is intended to carry, such as the rebar you might put into a concrete retaining wall. It holds the structure together. Secondary reinforcement is employed to maintain durability and aesthetics. It helps provide resistance to cracking and stress caused by temperature fluctuations and natural shrinkage of concrete as it dries. Rebar is also used to hold other steel bars in position. This helps accommodate loads and stresses that couldn't be handled by rebar alone. Some rebar is used in an exposed condition. Rebar comes in a number of different grades. The grade tells you how many thousands of pounds per square inch the rebar can withstand. This is usually listed as "ksi." A grade of 60 ksi means that rebar can withstand 60,000 pounds per square inch of tension before it deforms.